Hey there, my haggard harbingers of horror! It’s your ol’ pal Doc Mock, and I wanted to let you know that I’m once again returning to the Upright Citizens Brigade (UCB) Theatre in Los Angeles on Saturday, July 27th at 11:55pm for an all new Doc Mock’s Movie Mausoleum live show! As always, I’ll be sharing a movie from the past made to melt your minds into a gurgling gumbo. I’ll also be joined by some special guests (TBA) to commentate on the movie with me in front of our live audience! Miss Diagnosis will be interacting with the audience throughout the night as well, and she may have some prizes for a handful of lucky attendees, so don’t miss it! All that entertainment for only 5 bux! 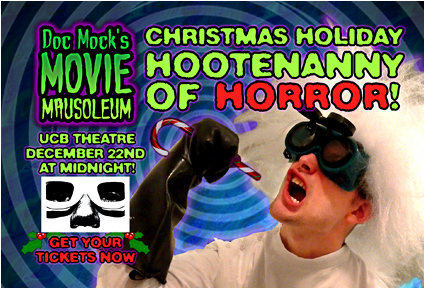 Who needs robot butlers to entertain you when you can go see Doc Mock ‘n friends live and in person!? Hope to see you all there for this b-movie July jubilee! Yo ho ho, my totally tubular toxic troglodytes! 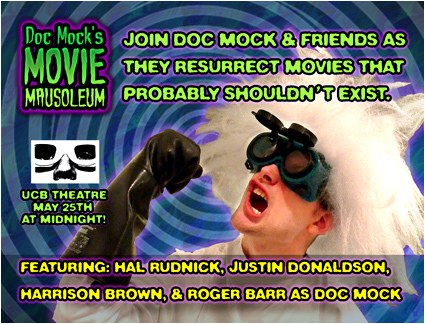 It’s your ol’ pal Doc Mock, and I wanted to let you know that I’m returning to the Upright Citizens Brigade (UCB) Theatre in Los Angeles on Saturday, May 25th at 11:55pm for an all new Doc Mock’s Movie Mausoleum live show! As always, I’ll be sharing a movie from the past made to melt your minds into a gurgling gumbo. I’ll also be joined by my special guests, Hal Rudnick (The Screen Junkies Show, Tournament of Nerds) and Justin Donaldson (The Screen Junkies Show, Tournament of Nerds), to commentate on the movie with me in front of our live audience! Miss Diagnosis will be interacting with the audience throughout the night as well, and she may have some prizes for a handful of lucky attendees, so don’t miss it! All that entertainment for only 5 bux! Who needs robot butlers to entertain you when you can go see Doc Mock ‘n friends live and in person!? Hope to see you all there for this amazing May memorial of merriment! Yo ho ho, my menacing militia of mutants! It’s your ol’ pal Doc Mock, and I wanted to let you know that I’m returning to the Upright Citizens Brigade (UCB) Theatre in Los Angeles on March 30th at 11:55pm for an all new Doc Mock’s Movie Mausoleum live show! As always, I’ll be sharing a movie from the past made to melt your minds into a horrifying stew. I’ll also be joined by my special guests, Colton Dunn (MADtv, Pretend Time, Key and Peele) and Eric Appel (NTSF:SD:SUV, Pretend Time, Eagleheart), to commentate on the movie with me in front of our live audience! Miss Diagnosis will be hunting for Easter eggs throughout the night as well, and she may have some eggciting prizes for a handful of lucky attendees, so don’t miss it! All that entertainment for only 5 bux! Who needs electroshock therapy when you can go see Doc Mock ‘n friends live and in person!? Hope to see you all there for one hellish hop down the bunny trail! Hey there, film freakozoids! I’ve got a nice Halloween video update for ya! This past weekend, I attended the 2010 Eyegore Awards and Halloween Horror Nights at Universal Studios Hollywood to cover the red carpet and speak with some nice people in the horror biz! Check out my two-part red carpet coverage of the 2010 Eyegore Awards to see me talking with the likes of Christopher Lloyd, Sid Haig, Corey Feldman and more! Thanks again to Universal Studios Hollywood for having me cover the red carpet at the Eyegore Awards once again! It was great talking with everyone and I had a blast in all the Halloween Horror Nights mazes! Looking forward to going back in 2011! Yo ho ho, movie maniacs! I just wanted to take a second to clear up what’s going on with Doc Mock’s Movie Mausoleum for those of you who haven’t already heard the news. First off, the show is NOT over yet… it’s in limbo. The studio where we shot it has been in turmoil for a while and that’s why we haven’t been able to do any new episodes recently. We had some amazing guests lined up as the show was constantly improving, so it’s hard having to take this much time off from being able to shoot new episodes. We’re not sure when (or if) the studio will be resuming normal operation, so rather than continuing to wait around and see what happens, we’re searching for a new home for Doc Mock’s Movie Mausoleum in the meantime. We really hope they can get back up and running soon, because we’d gladly go back on the air with them, but nothing’s more important to us than being able to bring our awesome fans new episodes of the Movie Mausoleum on a regular basis. These constant downtimes frustrate us just as much as they frustrate you, so let the hunt begin, because the Doc needs your help to find a new home! If you know of any studio operations in or around the Los Angeles area who are capable of doing a live streaming web show like ours, please have them get in touch with us. The best thing you can to do help Doc Mock’s Movie Mausoleum right now is to spread the word that we’re looking for a new home! You can also follow us on Facebook and Twitter for the latest news about the show and anything else we have going on. While you wait for new episodes, you can always catch up on all 32 episodes we have archived online for your viewing pleasure! Don’t worry guys, we’re not done with the show by any means, so hang tight and hopefully we’ll be back soon! Ever wonder what it would be like to join a high school honor society and quickly morph into rage-filled mutants after smoking some nuclear weed? Sure you have! And that’s why you need to watch our latest show! Yes indeedy, Episode 32 of Doc Mock’s Movie Mausoleum is now permanently archived online for your viewing pleasure! Big thanks again to our special guests Lloyd Kaufman and all of his Tromettes (including the fantastically unpredictable Bipolaria!) for joining in all of the tubular toxicity of episode thirty-two and then hanging out with everybody in the chat rooms during the post-show! 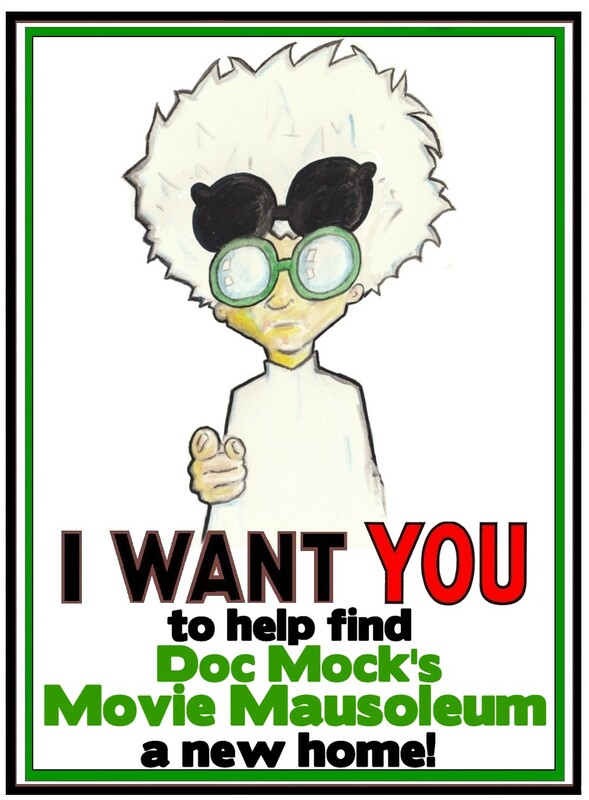 Stay tuned to DocMock.com for updates on when our next LIVE episode will air, and be sure to follow us on our Facebook and Twitter accounts! ENTER OUR TROMA CONTEST! Since Lloyd’s gonna be on the show, we’d like you guys to show some love for all those insane independent movies he’s produced with Troma over the years. We want each of you to draw a picture of Lloyd hanging out with any of your favorite Troma characters (Toxic Avenger, Sgt. Kabukiman, Poultrygeist chickens, etc.) and getting into some kind of trouble. As always, you do NOT have to be a real artist to participate in this. It doesnâ€™t matter if you want to draw it in Photoshop, MS Paint or even with finger paints… weâ€™ll be judging these entries solely on creativity and humor, not artistic talent. We’ll be showing ALL of the entries live on the air and letting Lloyd and his lovely Tromettes judge which entry is their favorite! Whoever wins will get some Troma goodies! Post links to your entries in this blog thread or email them to doc@docmock.com with the subject line “Doc Mock Troma Contest!” As always, you can enter as many times as you like, just make sure your entries are turned in by 4pm PST on Thursday, June 24th. If you turn them in later than that, we can’t guarantee that they’ll make it into the show in time. We’ve got a new LIVE episode of Doc Mock’s Movie Mausoleum coming up on June 24th that you absolutely won’t wanna miss. More details coming soon!